The sporting rivalry between Great Britain and Australia has taken team pursuiting to a new level over the last two days, and in Melbourne it’s the British who have come out on top. Two world titles and two world records have now come the way of Great Britain after the women’s team matched the men’s by breaking the world record and taking the world title. Only they didn’t just break the world record, they smashed it. Twice. In the qualifying ride in the afternoon they took the time down to three minutes 16 seconds, minutes after the Australians had themselves set a new world record. In the evening, with the Australian’s on the other side of the track, the record went to three minutes 15. The mark that many believed would be the target for gold in London. Not only was it a brilliant time, it was another brilliant race. The Australians raced away from the start line and after one kilometre were almost one-and-a-half seconds up, and the crowd were on their feet. Another lap later and the gap was even bigger. Slowly but surely the gap started coming down. Australia, who had been lapping in 15.2 and 15.4 seconds slowed to 16 second laps, while the Brits held steady at 15.5 and 15.7. It was slow progess, but ominously similar to the qualifying rides for anyone supporting Australia. The big shift came over the tenth lap. In just that one lap the British trio took 0.8 seconds out of their opponents and with it the lead. The crowd went quiet, and the advantage swung further round to Great Britain. Eventually they won by over a second, a huge shift in just eight laps. The key was Britain’s consistency. Over the course of twelve laps the difference between their fastest and slowest laps (not including the first lap) was just 0.625 seconds, whereas the Austalians had a difference of 1.3 seconds. A 15.5 second lap schedule, which is what the Australians started on, would lead to an approximate time of three minutes 13 seconds. Not that you can blame them for giving it a go. The British team have now won this title on four out of a possible five occasions, and have been virtually unbeatable over the last two years; the Australians had to try something. 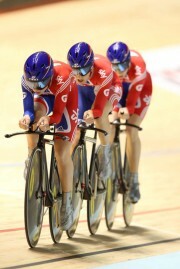 But the key to a good team pursuit schedule is consistency, and that’s how the British team won tonight. It may not sound exciting, but when it produces rides like tonight’s it is exactly that. “We knew they were up but we didn’t want that to put us off, so we just carried on with our own game plan. We managed to hold the pace consistently through the ride,” said Britain’s Dani King. It was Britain’s third gold as they stay top of the medal table. Germany now have two golds after Stefan Nimke won the kilo while Russia and Australia both have one. 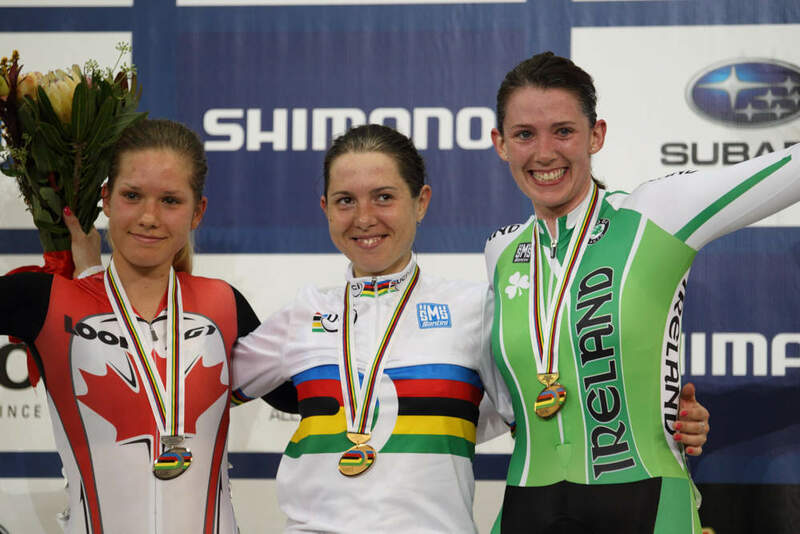 Today saw a bit of track history written when Ireland’s Caroline Ryan won bronze in the women’s points race. It was the first world championship track medal for Ireland. Ryan, a Garda from County Kildare, came to cycling from rowing in 2008. 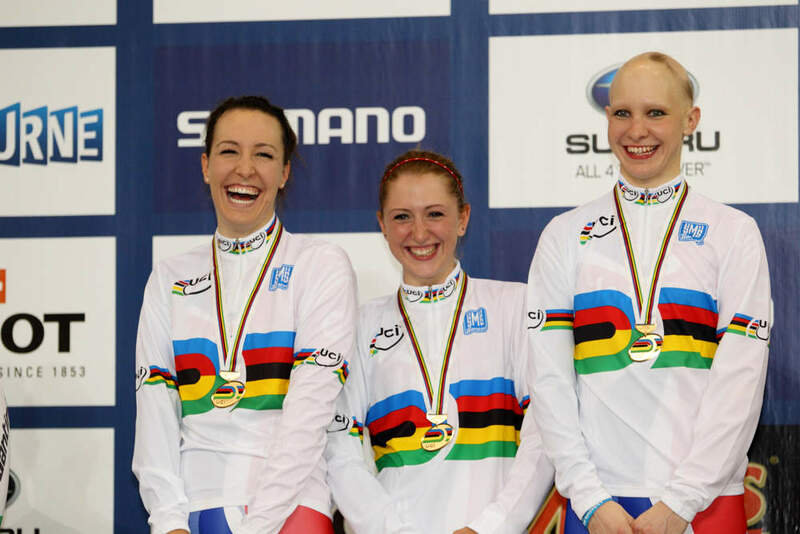 After getting hooked on track cycling following a training camp in Aigle, Switzerland she spent a year as a tandem pilot in the Irish paralympic squad before moving on to able bodied events. “I was in the off season from rowing and I was still going to go back for trials in the boat but I just got hooked as soon as I got on the track, I just loved it.” Ryan said afterwards. Victoria Pendleton was back in action today in the sprint. After qualifying fifth fastest she looked unconvincing in her first two sprints, but by the time she met Virginie Cueff of France in the quarterfinals she looked sharper. She’ll have to look sharper still if she’s to progress to the finals tomorrow as she meets Anna Meares in the semi final. Meares, the crowd’s favourite was untroubled in her sprint matches and had set a new world record in qualifying. After his heroics of yesterday Ed Clancy was back in action today as the men’s omnium started early with the flying 250m sprint. After winning that he placed seventh in the points race and tenth in elimination. Clancy goes in to the second day in third place with the pursuit and kilometre time trial to come, two of his strongest events.